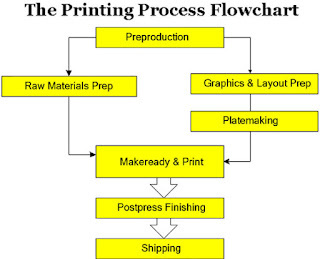 This is the step in the flowchart is where the customer is most involved with the offset printer. He must clearly communicate his finished product and provide all the resources possible to achieve it. Then the printer can proceed with it's own preparation for production. 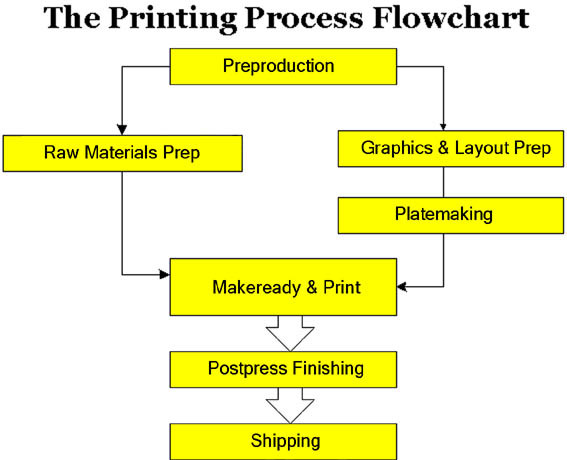 Alongside the raw materials ordering, the graphics and layout will be prepared in this offset printing process flowchart. Special software is used for pagination and layout that will put position the images into a format that allow the printing press to print the pages in order and in the right format. For offset printing, plates need to be made for the press. Once all pages are approved for layout on a computer, they are printed to aluminum printing plates. A laser burns the image onto the printing plates which create hydrophilic and hydrophobic areas of the plate. This is necessary as offset printing uses both water and ink to print. Once burned, these plates usually have the edges bent to mount on the press. The offset plates are then mounted on the press along will all raw materials ordered for the job. This will most certainly include paper and ink, but other minor materials necessary for the workflow. The offset printing process is a process requiring a perfect chemistry of ink and water to balance just right. The offset pressmen will start the press and try to achieve this balance as quickly as possible to achieve the proper density of ink for the right colors. They will also quickly try to achieve any on-press alignments for trimming and folding that may happen in this inline process. This is by far the most costly and complex of the workflow. In the offset printing press workflow, this may be one of the most overlooked. The customer may want products directly shipped to customers from the printer if this service is offered. Additionally, care must be taken as stacked items can topple. This is of course an oversimplified view of the process, but give you an idea. Please follow links in the article for more detailed explanations. It's really not surprising in some ways. Offset pressmen are generally employed in more metropolitan areas. Here is a more detailed breakdown to reveal exact numbers. There are some siginificant details in these figures. For example, Illinois doesn't stand out with an impressive number of jobs, but the employment per thousands jobs is significant. 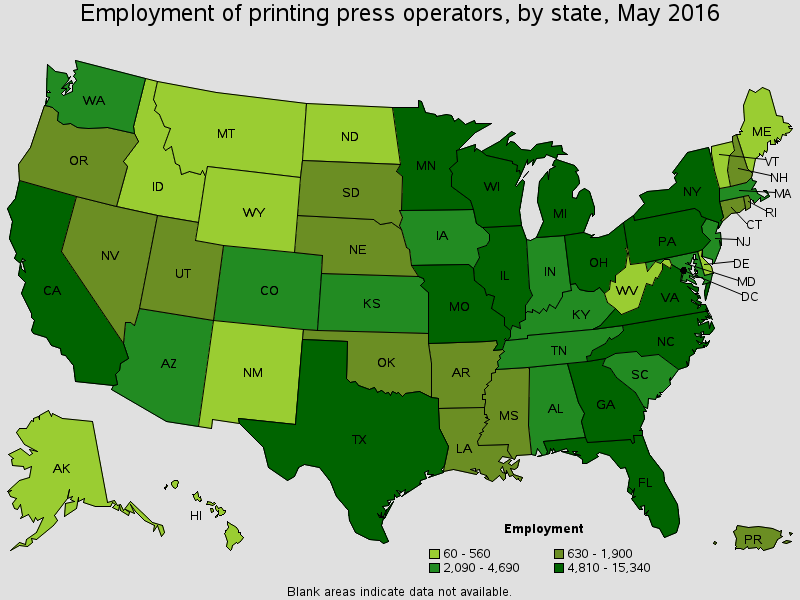 Its a hub for printing and the demand for printing jobs will certainly be felt more than in a place like California, even though it has more jobs. Significant too is hourly mean wage of $20.40. Of course this doesn't reflect the entire payscale from the newbie to the lead operator, but it tells that Illinois pay more for their pressmen. What time of day do mistakes most often occur? That was a question we put to ourselves recently in an effort to see if we could find a pattern. Everyone makes mistakes. But what I would like to offer here is some research we did into finding the time, frequency and cause of mistakes in our press room. True, they are not avoidable. But as Bram Stoker said in Dracula, "We learn from failure, not from success!" So I would like to share with you something insightful and practical that you can learn from and apply in your press room. I don't present the solution, but a way of learning from it. The green line above shows the number of occurrences while the blue bar represents how much press downtime resulted. Do you see a pattern? Remember it is the culmination of 2 years data and it shows definite patterns. Our press crews generally work an 8-5 shift and the occasional double shift. What we see in the graph is a spike in errors first thing in the morning. Then another spike between 11:00am and 12:00pm. That one hour represents the highest number of errors of any time of day and then tapers off the rest of the day until 5pm. So the natural question we asked ourselves was - why? We do not have any patterns in our printing schedule. In other words, there is no print job that comes along on a daily basis at that time. In fact, none of the work we do starts or finishes at that particular time. There was only one thing we found. At 11:30 our press crews start a lunch rotation. They go eat for 20 minutes and then return to the press. This process starts in earnest at 11:30 and tapers off until finished at about 12:30. During this time a little dosey doe takes place. The crew members "cover" for one another while the press runs. When we discovered this link, the cause was obvious. The lesson? It's hard to prove those conclusions without a wealth of data to back it up. A short sighted viewpoint would conclude that there is little effect on press production. And that running short handed may even save an employer some money. But as the data shows, the employer pays in other ways. So how do you avoid it? Here I offer no solution as I said at the outset. Everyone has to eat. People have to go the bathroom. Inevitably, pressmen will have to cover for one another. Perhaps a better question would be "How do you minimize these factors?" We have since taken steps to ensure that the crew is never short handed. Management comes out if need be to help relieve those going for lunch. We also try to avoid lunch rotations when doing complex make readies. Beyond that, it's hard to come up with a solution. But hey, solving print problems was never easy anyway.